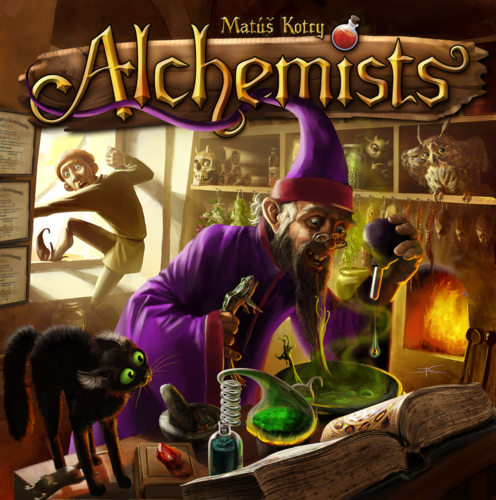 In from Czech Games Edition is Alchemists, a game of strategy, risk, and deduction. I received my new cauldron today. Finally, my laboratory is complete! For days, I have been gathering and drying ingredients in anticipation. What shall I mix first? I have a strong hunch about raven’s feather and mandrake root. And they say you can never go wrong with a toad. ...A little mandrake root, a little raven's feather. Toss them in the cauldron and see what they make. Should you drink it? Maybe not. After all, that's what students are for. Welcome to the world of Alchemists. Players are alchemists competing to discover the secrets of their mystical art. Points can be earned in various ways, but most points are earned by publishing theories – correct theories. Therein lies the problem. Players gain knowledge by mixing ingredients and testing the results using a card-scanning app on a tablet or smartphone. They deduce how to make potions that they can sell to adventurers. Gold pieces can be spent on magical artifacts, which are very powerful but also very expensive. Players’ reputations go up and down as their theories are published or disproven. At the end of the game, reputation is converted to points. Points are also scored for artifacts and grants. The player with the most points wins. Watch this video by Dice Tower for an overview of Alchemists. 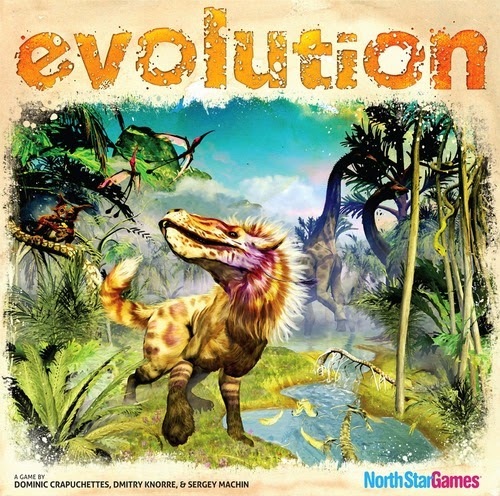 In from North Star Games is Evolution, a game where players must adapt to an ever-changing ecosystem in order to survive. In Evolution, players are in the midst of a dynamic ecosystem of limited resources and hungry predators. To survive, your species will need to adapt. Food is scarce and carnivores run rampant. Your choices will determine the fate of the world’s species: which will survive, which will thrive, and which will disappear from the planet forever. Your goal is to gain the most points by feeding your species, increasing their population, and evolving them to best ensure their survival. 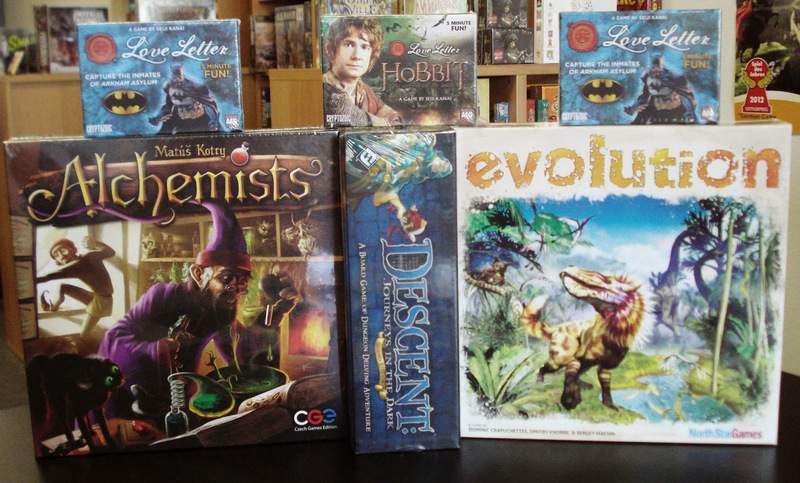 With over 12,000 different species to create, every game becomes a different adventure. Watch this video by North Star Games to learn more about Evolution. 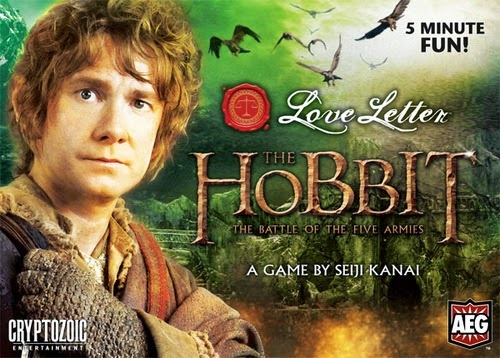 For fans of Seniji Kanai's popular card game Love Letter and fans of Batman and/or The Hobbit -The Battle of the Five Armies comes these 2 themed edition games. Both editions are a collaboration between AEG and Cryptozoic and are based on Love Letter, a card game of risk, deduction, and luck for 2 to 4 players. Take back the streets of Gotham City. The most notorious villains in Gotham City have escaped Arkham Asylum and it's up to the Dark Knight to round them up and return them to their padded cells. 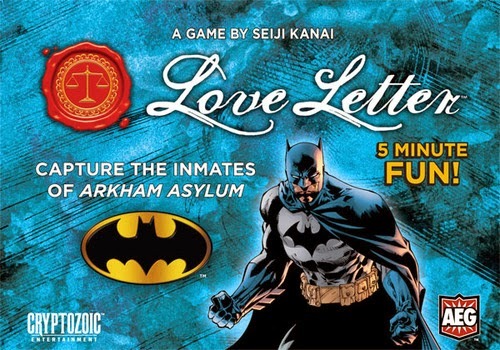 Earn Batman tokens by eliminating opponents and by winning each round for a new spin on classic Love Letter. Battle of the Five Armies Ed. This edition contains 17 cards and a slight twist on the classic game rules. The twist involves the cards One Ring, Legolas, and Tauriel. The One Ring card has a zero value when in play but have it in play at the end of the round and it's worth 7, equivalent to the Bilbo card. The Legolas and Tauriel, both value 3 cards, puts a twist on the the Baron card from the classic Love Letter game. When comparing cards with an opponent, Tauriel's power will knock out the card with the lowest value, while Legolas's power will knock out the card with the highest value.